Why WhatsApp Isn’t Popular in US? There are many famous application on the world. However some of these applications surprisingly very unknown at some regions, continents or countries of the world. WhatsApp is one of the most used applications as we have mentioned above and may be it has more users than Facebook Messenger at the moment. However the application is very unknown in United States. It is strange, right? Actually it is not because I have faced with similar incidents in the past. I was making friends from abroad for years ago on IRC and I have met lots of Americans there. I remember most of Americans have not MSN Messenger on those days but they use Yahoo Messenger. I wasn’t knew anything about Yahoo Messenger but some of them also don’t know about MSN Messenger too. Different applications/programs/messengers can be popular in different countries and WhatsApp one of these applications. Europeans and Asians may have friends from abroad since they visit other countries very often but it is hard to tell that it is same for Americans. WhatsApp generally popular with international communication. What Messenger Application Americans Use? Facebook Messenger: Facebook Messenger is very popular as same as WhatsApp and it is popular application almost every countries. You can chat with your Facebook friends on this app. There are too much complaints about Facebook Messenger from Android and iOS users but people do not give up to use this application since it is one of the most needed application for keeping in touch with friends. Skype: Skype is a Messenger which has been developed by Microsoft. The famous MSN Messenger has been replaced with Skype for ages ago. However it hasn’t got the same popularity after MSN Messenger removed. Skype is very popular in USA and many people are using this app in the country. GroupMe is another popular application of USA. Generally colleagues and students in the same friend group are using this application. You can create groups and you can communicate with different friend groups on this application. 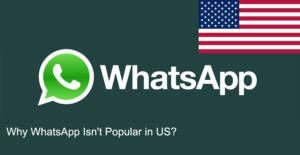 ← Does WhatsApp Work on United States of America?